Looking for items that promote going global? Look no further. Visit: The Global Small Business Depot -- a store for entrepreneurs and small businesses interested in going global. You will find caps, shirts (as shown -- I just bought to wear! ), pins and stamps. Take a look! 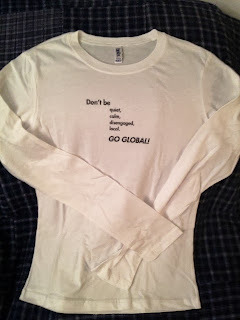 Full disclosure: We create these products for fun and to promote going global.